In 2002, Isaac Mizrahi for Target launched to great success. In the near decade since, every retailer imaginable has jumped on the diffusion line bandwagon- some for the better, others for the worse. One of the more recent collaborations is Jennifer Lopez for Kohls, a large collection of women's clothing, shoes, jewelry and housewares that has been touted as bringing a dose of Hollywood glamour to the masses at affordable price points. The other day, I headed over to the department store to see firsthand what Jenny from the Block had to offer the high-low world. Jennifer is known for being glamorous and a sartorial risk taker. Remember the plunging green Versace gown she once wore to the Grammys that shocked the world?! Well that is part of her appeal. Because of her style and reputation, one would envision Jennifer's Kohls collection to be both eye-popping and lust-worthy. Sadly, the collection proved otherwise. I would describe it as unimaginative, overpriced and easily forgettable. I saw a polyester dress for $84, acrylic sweaters for $80 and a pleather bag for $129- all in neutral colors and designs that have been done to death. A cheap looking metal necklace was outrageously priced at $48. 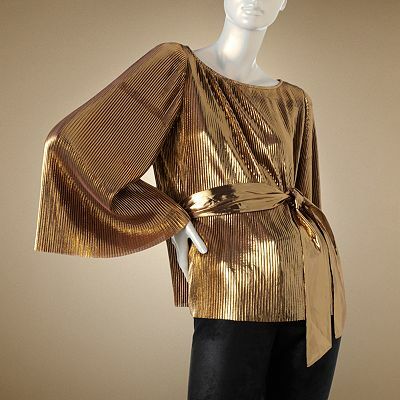 The sole piece that caught my eye was a pleated gold top. But I read the label and a 100% polyester shirt is definitely NOT worth a $54 price tag. I wonder if Jennifer actually had any hand in these designs or if she simply lent her name to the collection. Whichever is the case, this isn't Hollywood glamour. I won't be purchasing and I wouldn't recommend Bon Vivant + a Budget readers buy it either... Next! lol! you are so bad!! just like that piece of thread on the D&G dress lmao!! I love how you say what you really feel! Your blog is so refreshing!!! I wish you much success!!! and of course, best of luck to you as well!